TURN BATH TIME INTO THE BEST PART OF YOUR DAY - Turn bath time into spa time. You can relax and revitalize your body and mind. Get bath to nature! 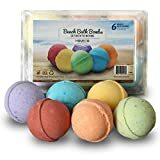 HEAL YOUR SKIN WHILE RELIEVING THOSE ACHES AND PAINS - With the addition of cocoa butter and essential oils, these bath bombs turn your tub water into a healthy soak that will help relieve aches and pains while moisturizing your skin. Great for dry skin! MAKES A FANTASTIC GIFT - There is no better gift than the gift of relaxation and better health. Whether it's Mother's Day, Father's Day, Valentines Day, Christmas, Birthday, or just because, this gift set will exceed expectations. MADE IN THE USA - Beach Bath Bombs by HomEco are handmade right here in the USA. Get Bath to Nature with these fizzy and fragrant scents for a blissful escape to the islands. Indulge, relax and treat yourself to a spa-like experience. For men, women and children alike! Beach bath bombs are made from quality ingredients and won't leave an oily residue behind. Kick back, unwind and drift away. Each bath bomb weighs approximately 2.5 oz. Fill the bathtub with water and add one bath bomb. Melt your day away and get back to nature. For external use only. Discontinue if skin irritation occurs. At HomEco, we continually search for the next eco-friendly, extremely useful product. We have a strong commitment to a healthy planet and quality products. We will not compromise on either.